Pink and Raw to Classy Colonial! and liked the idea of the black steps and trim on the door! Before: Popped roof panel in the front. After: Roof panel sanded, glued down, painted and shingled! BEFORE: Water damage on the walls. AFTER: Ready for the family to move in! The entire first level received wood flooring . . .
AFTER: Primed, flooring down, ready for play! combined with the stairs, they were my favorite part of this renovation! AFTER: One classy home anyone would be proud to have on their block! BEFORE: House was a bit drafty. AFTER: Loving the Majestic Mansion's Palladian Front Door! Up this week is another Colonial style house that is just getting an archway cut out from the kitchen to the living room and a replacement window put on the front. Some roomboxes for a customer are getting lights wired in to the ceilings. A few display boxes for the store are getting wallpapered. And the customer's Contemporary Ranch house is assembled to the shell stage (no exciting stories there other than one wall having been cut too long by Real Good Toys which caused some minor expletives to be uttered) and it is ready to be painted! I will be busy the next week or two getting these small projects out of the way so that we can all enjoy the next project: decorating a Haborside Mansion! I get very involved with the dollhouses and projects I work on. I get to know their little idiosyncrasies, the small bits that make a room just perfect, or the minor imperfections that cause one wall to stick out slightly more than the others, etc. I even begin to talk to the dollhouses. Yes, I talk to the dollhouses ("I know you'd look really cute with a pediment here, but I'm already $10 over budget so you aren't getting one!"). Sometimes they answer back to me in my mind. So, this house is being picked up on Tuesday, finished to the customer's specifications. (Before and After pics will be in next blog entry on Tuesday). But I really want to make some minor changes to it. The front door the customer picked is a beautiful white Majestic Mansion's door (I love Majestic Mansion stuff!). But the house is also painted white. It looks nice, but the dollhouse and I have been talking . . .
Love that front door! Can you see it? Overall view of the exterior, looking like a lovely little home. I don't know if the customer has steps for the house or not, but if she does, I think they need to be black. And with some touches of black on the door, I think it would really pop! Now I see that door I love so much! Amazing what I can do with black construction paper, huh? 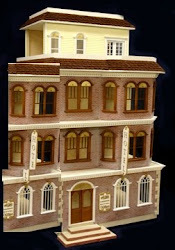 The dollhouse just whispered to me that I ought to email the customer to ask if she has front steps . . .
Steps of Progress . . .
Best part of this redecoration job has been the stairs! Priming the inside, painting the outside white, painting shutters black, and adding gray shingles to the roof is fairly straightforward work that doesn't involve any spark of creativity or excitable sense of 'that looks smashing'! So I was pleased when the customer said she wanted wood floors installed on the first floor and the stairs to be a paint/stain combo! Staining didn't have to be perfect because white paint would cover any mistakes. These are my favorite finishes for stairs! Sometimes found in Federal, Empire, Victorian, and contemporary homes (roughly 1780-present), the paint/stain combo was originally a safety precaution: pre-electricity times made steps a hazard to see when climbing the stairs at night, holding that flickering candle whose light projection barely reached past your knees. The contrast of the white riser and stained tread on stairs made it easier for someone climbing the stairs to see where the next step was. All ready to be glued back into the house! Now it's just a crisp, clean effect and looks elegant on staircases, even dollhouse stairs! Work Coming Out of the Woodwork! As soon as I took out my own personal project to seriously work on it (Leaky Cauldron/Diagon Alley), a slew of customers dropped off their projects they want/need done in the next 2 or 3 months! There's five different customer projects I'm working on at the moment . . . .
First up: A pink dollhouse that was in a garage for a decade or two and is being renovated for a daughter! Mostly this is a clean-up, painting and shingling job. This pink house will get a white house body, black shutters, and gray shingles! Plus it will get a new stunning Majestic Mansion's front door! The rooftop is loose (as are some of the interior walls) and they needed to be glued back in place. Rooftop is popped up in the front and not laying flat. The interior had never been finished off before, unless spider webs and dirt are your idea of a snazzy decor. The raw wood has some water stain/mildew damage that we have to clean and seal. And somewhere along the way a mouse decided that this was a perfect home for him/her and made every room a bathroom! Overall view of interior. Bottom level will get wood floors. Stairs are to be two-toned: stained treads and handrails, white painted risers and spindles. The rest of the interior will be primed and sealed. Spider webs hang from the ceilings . . .
s/he used the corners for bathrooms. Water damage is in various places throughout the right side of the house. My dentist would probably freak if he knew what I do with those free sample toothbrushes he gives me after a dental cleaning . . . Cleaning the stairs: bottom six steps are cleaned. The shingles are stained and drying (it's a five day process to dry them so it takes a while) and primer is in most of the house now. In the evenings, after work, I am assembling a contemporary ranch dollhouse kit for a customer. It's a straightforward job so no photos of that, unless something wildly funny happens while I'm assembling it (like if I nail it to the table again or glue some part of myself or my clothing to it). Another two weeks or so and I'll be on to the next house (a colonial style house getting an alteration) . . . .